Writes Tina: "This is the most charming notebook I have ever seen. It’s based based on the one Jason Polan uses while moving around and sketching the world. He holds his notebook close to his face when he draws, so he thought it would be appropriate to put eyes on the notebook’s back side. LOVE!" 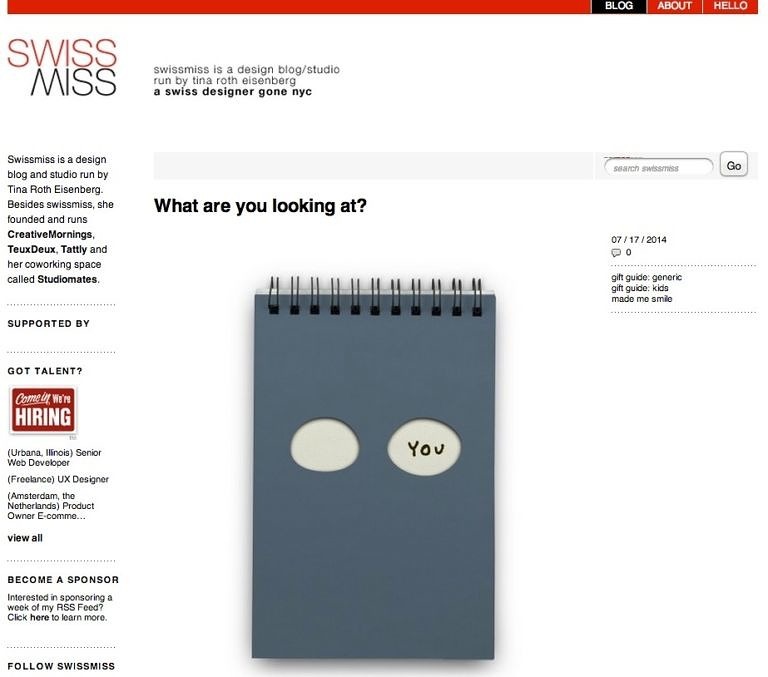 This was a true treat in our virtual mailbox, after Tina Roth Eisenberg, the trendsetting doyenne of the blog Swiss Miss, received an actual package containing Jason Polan's Observation Notebook in her snail-mailbox. WTF, Jennifer Aniston? It’s Our “WTF” Feature! A great read on how Jennifer Aniston (yes, Jennifer Aniston!) uses our WTF Stamp.